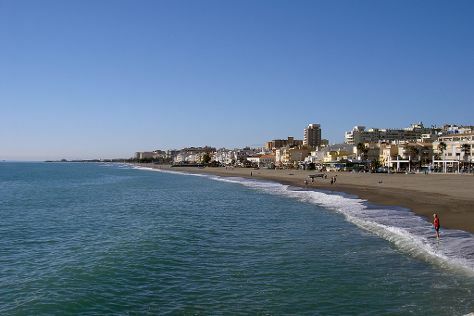 Stretching from the foothills of the Sierra de Mijas mountain range to the Mediterranean ocean, Benalmádena offers all the highlights of southern Spain: traditional whitewashed villages, beautiful Costa del Sol beaches, and strong Andalusian influence. Step off the beaten path and head to Playa La Carihuela and Puerto Cabopino Beach and Marina. Kids will enjoy Playa El Bajondillo and Bioparc Fuengirola. Get out of town with these interesting Benalmadena side-trips: Nerja (Moin Moin Nerja / Deutsche Backerei, Fundación Cueva de Nerja, & more), Ronda (El Tajo, Puente Nuevo, & more) and Centro Historico de Estepona (in Estepona). There's much more to do: take in the waterfront activity at Benalmadena Puerto Marina, admire nature's wide array of creatures at Zoo de Castellar, make a splash at Parque Acuatico Mijas, and find something for the whole family at Tivoli World. To find ratings, photos, more things to do, and more tourist information, refer to the Benalmadena trip builder. If you are flying in from United Kingdom, the closest major airports are Málaga Airport, Jerez Airport and Sevilla Airport. In July, daily temperatures in Benalmadena can reach 36°C, while at night they dip to 24°C. Wrap up your sightseeing on the 15th (Sat) early enough to travel back home.